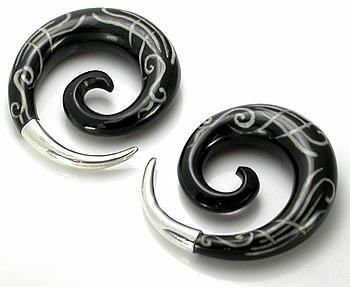 These Spiral Silver Tip Black Horn Earrings are sure to add a swirl of tribal flare to any jewelry collection. Midnight black in color and featuring a series of silver-painted tribal patterns, these earrings are available in sizes 6g up to 12mm. The Spiral Black Horn Silver Tip Earrings are sold as a pair.